Dr. Yochanan Shachmurove is Professor of Economics and Business at the City College and the Graduate Center of the City University of New York. He has worked with Harvard Institute for International Development advising the government of Ukraine with regards to its macroeconomic policies, including energy and natural resources issues. He has served as a Guest Editor for three special issues of the International Journal of Business, two of them dealing with Financial Markets of the Middle East, and one co-edited with Nobel Laureate Professor Lawrence Klein about the BRICs (Brazilian, Russian, Indian and Chinese economies), and as a Guest Editor for two issues of the Journal of Entrepreneurial Finance and Business Ventures. He is the Editor of the Proceedings of the Academy of Entrepreneurial Finance, 2002. He has been on the board of many journals, including Montenegrin Journal of Ecology, Studia Historiae Oeconomicae, The Journal of Adam Mickiewicz University, Poland, Poznan University of Economics Review, Economics and Economy, Interdisciplinary Journal of Economics and Business Law, Montenegrin Journal of Economics, (Co-Editor with Veselin Draskovic), Montenegrin Journal of Economics, Polityka Wschodnia – Eastern Politics, Journal of Quantitative Methods for Social Sciences, Foundations of Management, Quantitative Methods in Economics, International Trade Journal, Empirical Economics Review, The International Journal of Finance, The Journal of Entrepreneurial Finance, Frontiers in Finance and Economics, International Journal of Business, Global Finance Journal, The Journal of Entrepreneurial Finance and Business Ventures, The American Economist, and the Indiana Academy of the Social Science. Dr. Shachmurove has taught at leading institutions of higher learning in five continents: Asia, Africa, North America, South America, Europe, and Australia. Examples are, the University of Pennsylvania, Harvard University, Temple University, Indiana University – Indianapolis, University of Minnesota, National University of Kiev – Mohyla Academy, Ukraine; Taras Shevchenko National University of Kiev, Ukraine, New Economic School, Russia; Moscow State University, Russia, The University of Warsaw, Poland, Beijing Jiaotong University, Beijing, P. R. China, Pokhara University, Nepal and Bar- Ilan and Tel - Aviv universities in Israel. He has been awarded four Fulbright Senior Specialist awards in Shanghai, China in 2004, in Lodz, Poland in 2003-2004, in Warsaw, Poland in 2010-2011 and in Kiev, Ukraine in 2014. Dr. Shachmurove has published extensively in the areas of economics, finance and management with more than 100 refereed papers and more than 110 papers accepted for presentation at professional meetings throughout the world, travelling to numerous numbers of countries. His papers are published in journals including, among others, Kyklos, Public Choice, The Manchester Journal, Review of International Economics, Review of Development Economics, The World Economy, Journal of Policy Modeling, Journal of Economic Modelling, International Trade Journal, The Journal of Energy and Development, Energy Economics, Comparative Economic Studies, Justice Quarterly, Papers in Regional Science, Journal of Economic and Social Measurement, Applied Economics, Global Finance Journal, Applied Financial Economics, Journal of Futures Markets, The Journal of Derivatives, North American Journal of Economics and Finance, International Journal of Manpower, and International Migration. Professor Shachmurove has been awarded grants from, among others, the Kauffman Foundation (several grants), The U.S.A.’s State Department, The Institute for International Education Research (several grants), The Eurasia Foundation, Ukraine, Russia and the U.S.A.; University of Pennsylvania, Institute for Economic Research, University of Pennsylvania, Center for Analytic Research in Economics and the Social Sciences, The New Economic School, Moscow Russia, The Kasierer Institute for Research in Accounting, the Israeli Institute of Accounting Research, The European University Institute, Indiana Department of Commerce, and the Hudson Institute. Dr. Shachmurove has been awarded four Fulbright Awards. 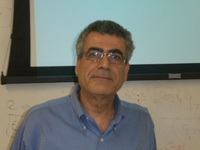 Professor Shachmurove’s main research interests are in applied econometrics (including vector auto regressions, Bayesian vector auto regressions, emulative neural networks, non-linear deterministic systems, and chaos), international economics, industrial organization, entrepreneurial finance, advanced futures and options. B.A., Tel Aviv Univ., M.B.A.; M.A., Univ. of Minnesota, Ph.D.
Shachmurove, Yochanan, 1998. "Portfolio Analysis of South American Stock Markets," Applied Financial Economics, Taylor and Francis Journals, vol. 8(3), pages 315-27, June. Kellman, Mitchell & Shachmurove, Yochanan & Saadawi, Tarek, 1996. "Import vulnerability of defense-related industries: An empirical model," Journal of Policy Modeling, Elsevier, vol. 18(1), pages 87-107, February. Hakim, Simon & Shachmurove, Yochanan, 1996. "Social cost benefit analysis of commercial and residential burglar and fire alarms," Journal of Policy Modeling, Elsevier, vol. 18(1), pages 49-67, February. [Downloadable!] (restricted) Shachmurove, Yochanan & Spiegel, Uriel, 1995. "On Nations' Size and Transportation Costs," Review of International Economics, Blackwell Publishing, vol. 3(2), pages 235-43, June. Chow, Peter & Kellman, Mitchell & Shachmurove, Yochanan, 1994. "East Asian NIC manufactured intra-industry trade 1965-1990," Journal of Asian Economics, Elsevier, vol. 5(3), pages 335-348. Guttman, Joel M & Hilger, Naftali & Shachmurove, Yochanan, 1994. "Voting as Investment vs. Voting as Consumption: New Evidence," Kyklos, Blackwell Publishing, vol. 47(2), pages 197-207. Guttman, Joel M & Shachmurove, Yochanan, 1990. " Dynamic Optimization of Political Popularity in an Empirical Macroeconomic Model," Public Choice, Springer, vol. 66(1), pages 51-66, July.